PS 100 is an elementary school that sits in the midst of Trump Village in Brooklyn, between Coney Island and Brighton Beach. 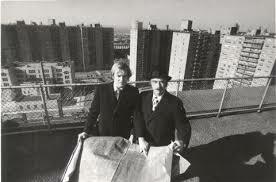 The “village,” a vast array of virtually identical apartment buildings, is named after its developer, the elder Trump, the guy who sent his rambunctious son to military school to try to teach him some manners. I attended PS 100 for one year, my sixth grade. When the weather was inclement, students would gather inside for PE, and the favored activity was dodgeball. I was particularly good at dodgeball, consistently coming in second place after Marty Schneer. In those days, it bothered me greatly that Marty always beat me, especially because he managed to garner all the attention and I felt rather invisible—even though invisibility is somewhat of an advantage when playing dodgeball. Surviving after all my classmates but one were eliminated was still quite an accomplishment, though, and lest you think I am bitter about coming in second, let the record show that not only did I eventually get over it, I am now happy about not coming in first, because I have come to appreciate the benefits of dwelling in the shadow of something or someone else. Living in the shadows means not having to deal with the poisonous rays of the sun, the heat it produces, or the unearned perspiration. Repeated harsh exposure to the sun not only causes all sorts of bad things, it also exposes you to the view of others. That may be a good thing if you had the good looks of, say, a Marty Schneer, but not so helpful if you were a big-nosed, weak-chinned, pimple-ridden, skinny kid like me. People like me need to find other ways of gaining exposure, so we must develop other skills. Sometimes, certain skills are best nurtured in the dank corners of shadowy places. Sunflowers can be big and smiley, but oh, the complexity and depth of shade-grown mushrooms can be stunning. We must learn to do the things that are best done when others aren’t looking, such as studying for long hours, or simply developing rich and dangerous fantasy lives that seem to grow heartily in the gut-wrenching, insomnia-stirred hours spent alone in our rooms. The advantages of being second-best were capitalized upon by the advertisers who developed the Avis car rental campaign that was so good that I remember it 30 years later— unnamed Hertz was always first, and Avis was always second, so the Avis motto was “We Try Harder.” There’s a slight duplicity in that motto, oh wonder, because being second best in a field of hundreds or thousands of competitors probably requires that you already tried a lot harder than the rest. Maybe that’s why it worked so well, because while you were thinking they were comparing themselves to the best, they were really gloating about being better than the rest. I am not sure that “trying harder” would have flown with my father, who used to respond to my saying that I was trying to do something by saying that there was no such word as “try,” which, although not accurate, got his message across clearly. I did, however, have to try pretty hard to become a B plus student, or, as they might have said in New York where numbers are valued more than letters (there are a lot more of them to choose from), a solid “88”. The whole grading thing and comparing oneself to others is something that has troubled me ever since working at an alternative elementary school while attending college. The students there received no grades, following a trend in education that stemmed, if I remember correctly, from the Summerhill School in England. The radical idea behind Summerhill was that academics should revolve around the child’s needs and personality, and not the other way around. In that kind of environment, if grades were to be given at all they should be given to the instructors and not the kids, because it was the instructors’ job to understand the needs of kids. Coincidentally, after working at the Farm School at UC Irvine, where my own grades were not stellar, I transferred to the ungraded UC Santa Cruz. I remember the brouhaha that was unleashed when the administration struggled with the idea of adding grades as an option. As a pilot, I know my skills are very poor when compared to any of the instructors who sit next to me in the right seat, or an aerobatic pilot. On the other hand, compared to a 63-year-old with roughly 350 hours of experience, I don’t think I’m that bad. I know I’m not near the best, but I am good enough and confident in my skills. I do admit to some hubris in my self-assessment as a psychologist, but I have lived in that arena for as long as I can remember. I have been practicing for so long that I find by some miracle that I often get it right. Psychologists know a good psychotherapy session the way a pilot or a gymnast knows a good landing. I haven’t played dodgeball in a long time, and even if I could find enough people to make it interesting, it strikes me now as a rather cruel game. It echoes, though, those years in New York, where it seemed as though survival came down to just wantonly throwing something at another person or evading what seems like random acts of unkindness. It was dog eat dog; everything was graded, and survival meant being the fittest of them all. I’m not too angry about it. After all, it taught me how to always strive to be second best. Conversely, I was always the second person hit and put out in dodgeball. Horrible feeling. I also was second to the last person picked on any elementary school athletic team, consistently. A worse horrible feeling! Gee….